In the evening of January 31, Duchess Catherine of Cambridge, Prince William, Crown Princess Victoria and Prince Daniel attended an event at the Fotografiska Gallery in Stockholm, which at night boasts glittering views over Stockholm. The Duchess wore ERDEM Christina Devore Velvet Midi Dress. 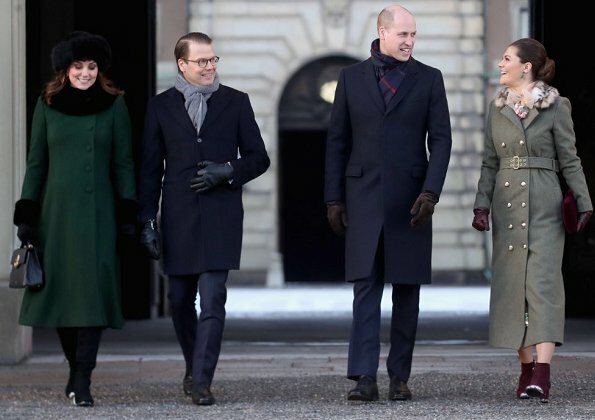 Prince William and Catherine, Duchess of Cambridge joined Sweden’s Crown Princess Victoria and her husband Prince Daniel for tea this afternoon and met with Princess Estelle and Prince Oscar at Haga Palace in Solna, on the second day of their relationship-building tour of the Nordic countries. 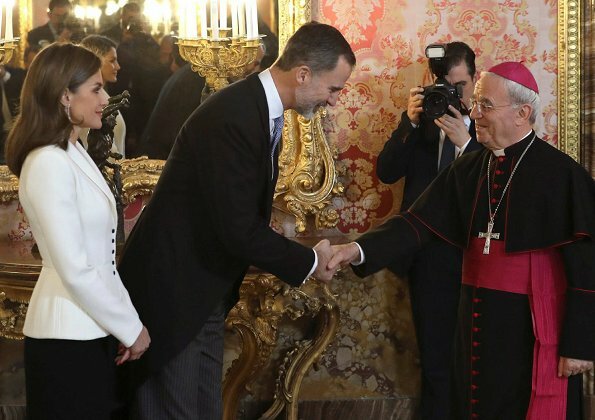 On January 31, 2018, King Felipe VI of Spain and Queen Letizia of Spain attended the Foreign Ambassadors Reception at The Royal Palace in Madrid, Spain. Catherine, Duchess of Cambridge and Prince William, Duke of Cambridge accompanied by Crown Princess Victoria and Prince Daniel visited the Karolinska Hospital in Stockholm. 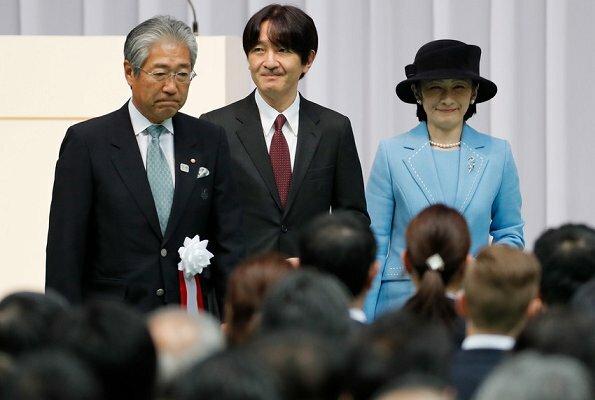 The Royal Couples met with the academics and practitioners. 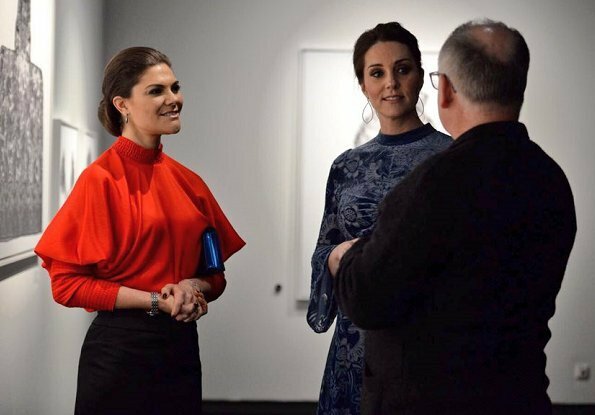 The Duke and Duchess visited the NK Department Store with Crown Princess Victoria and Prince Daniel to open an interactive exhibition of UK design, fashion and brands that operate in Sweden. 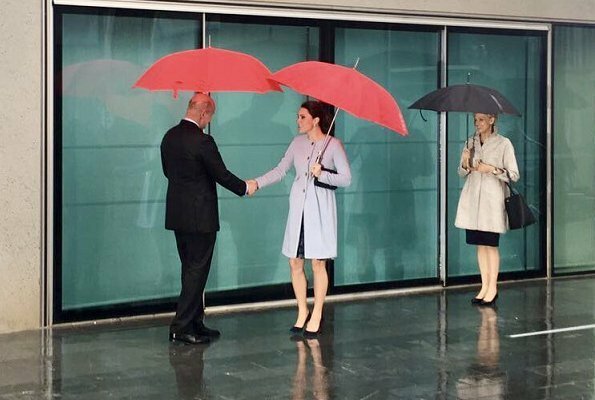 The Duchess wore a red and white houndstooth Catherine Walker coat. On January 30, 2018, Crown Princess Mary of Denmark attended Designers' Nest fashion show at Copenhagen Hotel d'Angleterre, which is held in connection with Copenhagen Fashion Week and which gives an opportunity to exhibit a part of collections of Scandinavian design students. 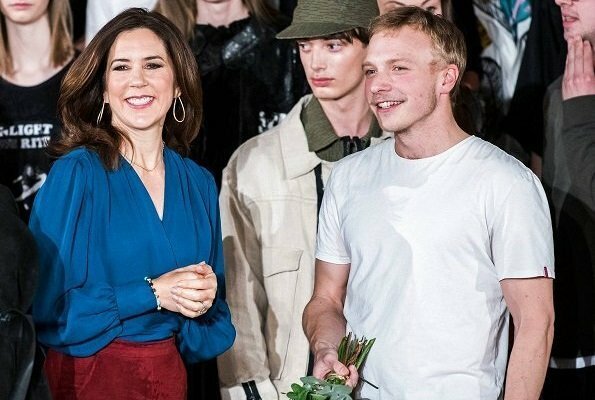 Princess Mary presented Designers' Nest 2018 Award to the winner designer. The award is 50.000 DKK. 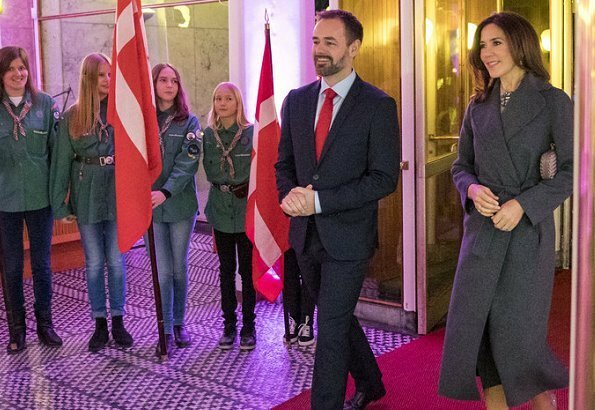 In addition, Crown Princess Mary attended a dinner given in connection with opening of Copenhagen Fashion Week at Copenhagen City Hall (Rådhus). 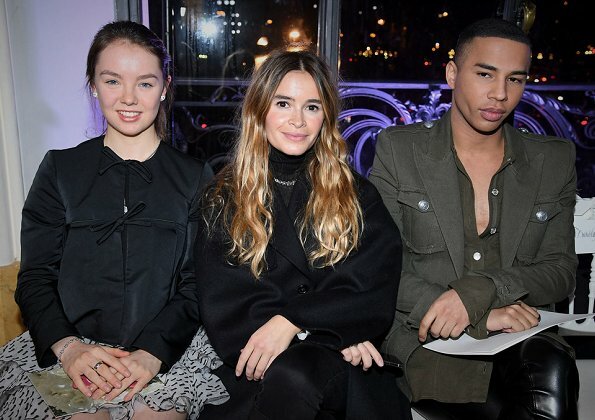 Copenhagen Fashion Week is the biggest fashion event of Northern Europe and held twice a year. 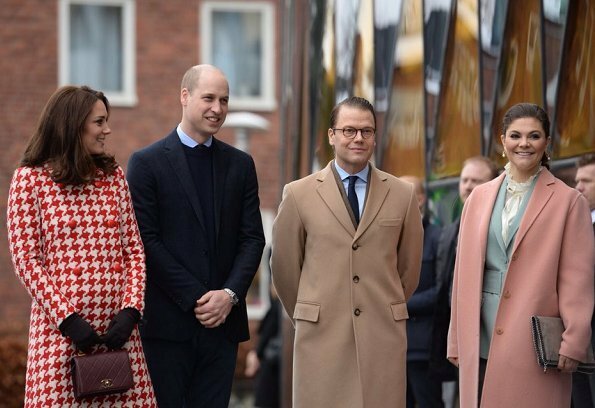 On January 30, 2018, Catherine, Duchess of Cambridge and Prince William, Duke of Cambridge, Crown Princess Victoria and Prince Daniel went for a walk in Stortorget (Old Town - Gamla Stan) and met with the crowd. 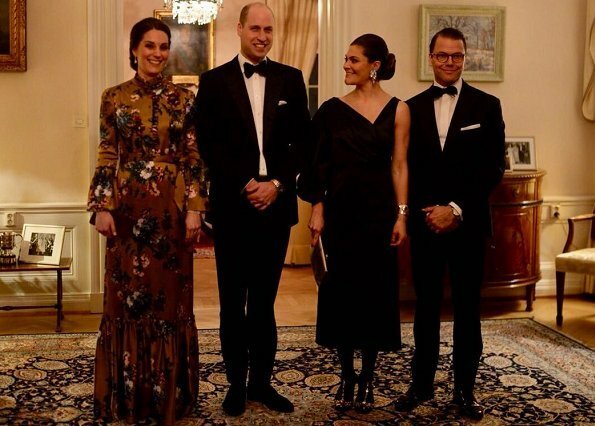 Then, Duchess Catherine and Prince William, Crown Princess Victoria and Prince Daniel visited Nobel Museum in Stockholm. 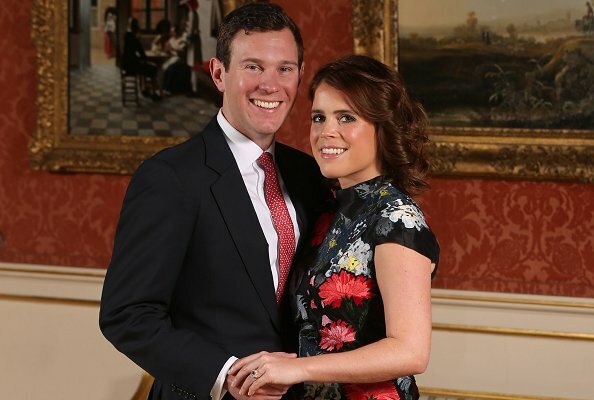 (The Duches wore a new bespoke Catherine Walker coat and dress). 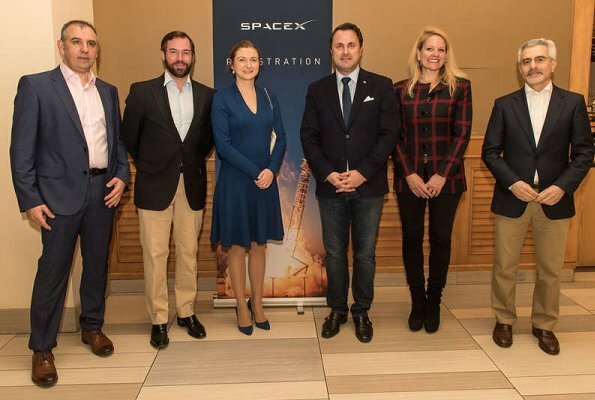 On January 29, 2018, Hereditary Grand Duchess Stephanie of Luxembourg and Hereditary Grand Duke Guillaume of Luxembourg visited GovSat company at Cape Canaveral (Orlando) in Florida. The satellite will be operated by GovSat, a public-private joint venture created in 2015 between the Luxembourg state and SES. The satellite will be sent to the space with a Falcon 9 rocket which belongs to SpaceX. Duchess Catherine of Cambridge and Prince William, Duke of Cambridge visited Hammarby IF Bandy team in Vasaparken. 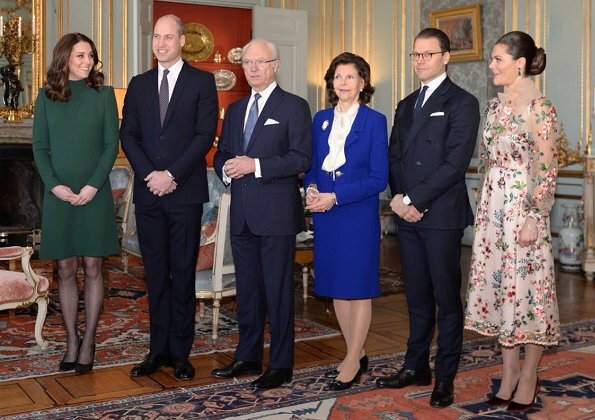 Then, Duchess Catherine ve Prince William attended a lunch at the Stockholm Royal Palace as guests of King Gustaf of Sweden and Queen Silvia of Sweden. Crown Princess Victoria of Sweden and Prince Daniel also attended the lunch. The Royal Couples will visit Nobel Museum after the lunch. Prince William and Catherine, Duchess of Cambridge arrived in Stockholm, Sweden. The Duke and Duchess of Cambridge will stay at the British Residence during their visit to Stockholm. 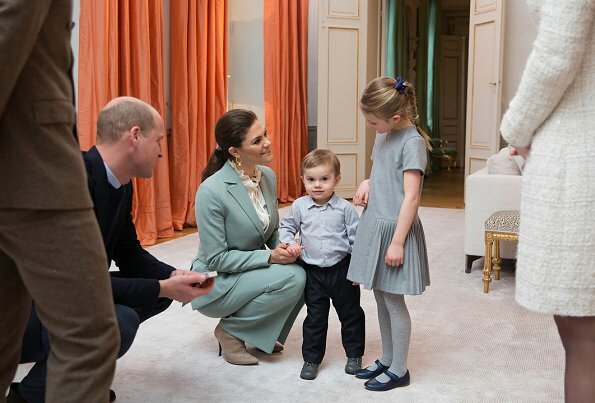 Prince William and Duchess Catherine is currently making a 2 days official visit to Sweden. The Duchess is wearing her pink Mulberry coat. King Felipe of Spain will celebrate his 50th birthday on January 30. 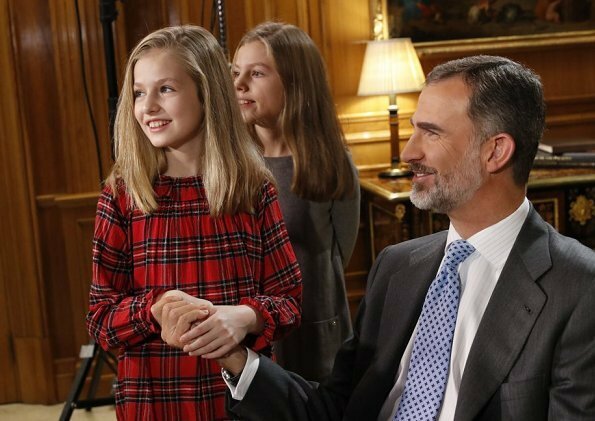 On the occasion of that birthday, the Royal Palace released a series of unreleased photos showing King Felipe in official events. 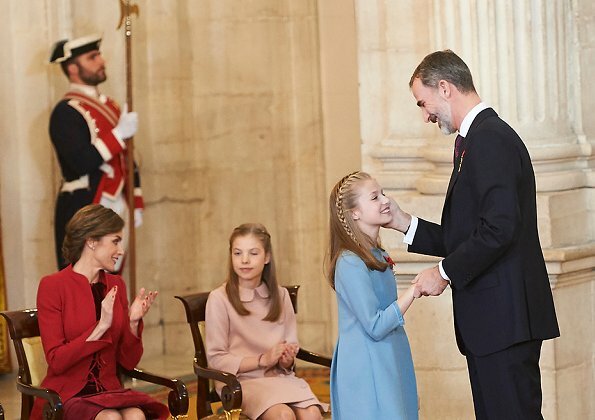 On the occasion of that birthday, The Royal Household of Spain released a video showing events and domestic lives of King Felipe, Queen Letizia and their daughters Crown Princess Leonor and Infanta Sofía. 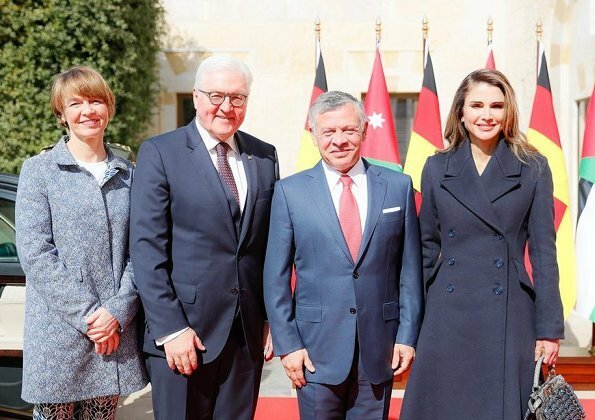 On January 28, 2018, Jordan's King Abdullah II and Queen Rania welcomed German President Frank-Walter Steinmeier and his spouse Elke Buedenbender with a state ceremony held at the Husseinia Palace in Amman. Germany's President Frank-Walter Steinmeier arrived in Jordan on Saturday for a four-day trip across the Middle East. Along with his wife, Elke Buedenbender, Steinmeier will also visit a refugee camp. 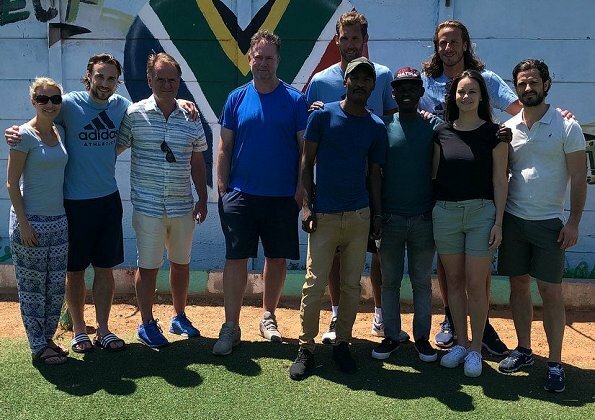 On January 26, Friday, Princess Sofia and Prince Carl Philip of Sweden met with attendees of Project Playground in Cape Town, South Africa. Project Playground is a non-profit organisation which focuses on improving life opportunities for children and young people. 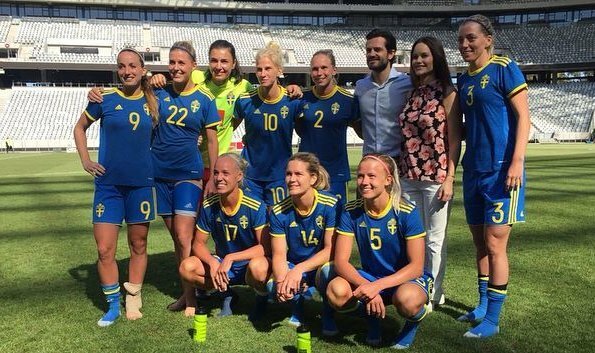 It was founded in 2010 by Princess Sofia and Frida Vesterberg. The Project currently helps about 750 children and youth in South Africa. 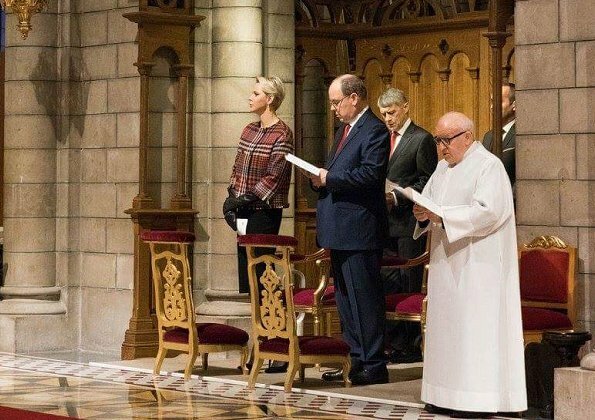 On January 27, 2018, Prince Albert II of Monaco and Princess Charlene of Monaco attended the celebration of the Sainte-Devote in Monaco. Saint Devote is the patron saint of the Grimaldi family, reigning in Monaco, and is celebrated each year as a national holiday. It is believed that Saint Devota protects the Principality in bad times. 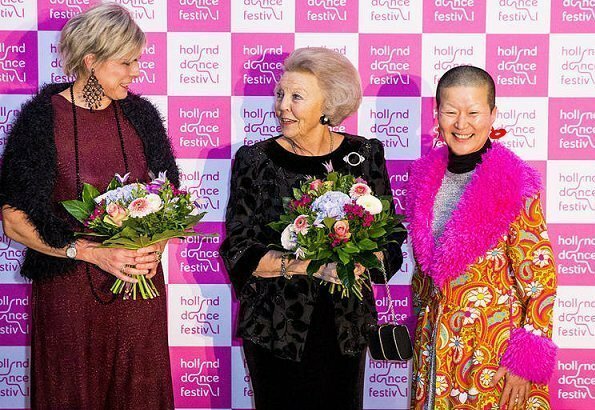 Princess Beatrix, Princess Laurentien and Prince Constantijn attended opening of the 16th edition of the Holland Dance Festival held at the South Beach Theater in Hague. The royal family met with Russian ballerina Diana Vishneva and artistic director of the Holland Dance Festival, Samuel Wuersten. During the Holland Dance Festival more than 50 performances were programmed in which dancers from 19 countries perform. 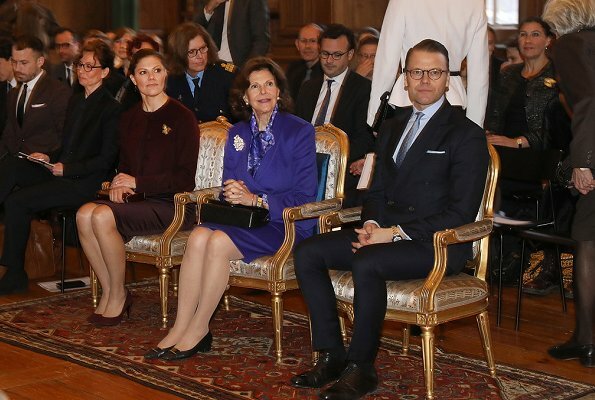 Queen Silvia, Crown Princess Victoria and Prince Daniel attended a seminar held at Stockholm Royal Palace by The Living History Forum in connection with Holocaust Memorial Day. The Living History Forum is a Swedish public authority working for tolerance, democracy and human rights. 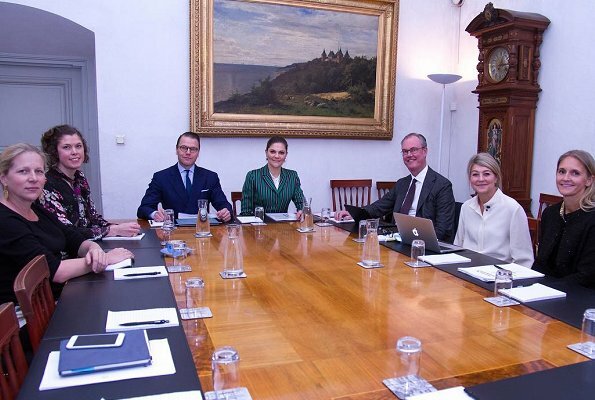 Before noon, Princess Victoria and Prince Daniel attended a briefing held at the Royal Palace by Ministry of Foreign Affairs, relating to the Sweden visit of The Duke and Duchess of Cambridge. 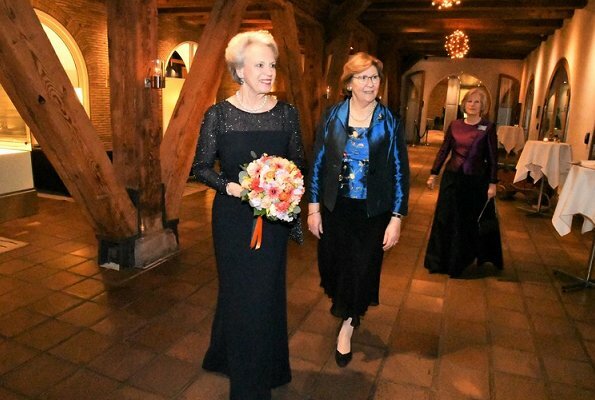 Yesterday evening, on January 25, 2018, Princess Benedikte of Denmark attended the 40th anniversary dinner for the International Women's Club (IWC) was held at the Admiral Hotel in Copenhagen. 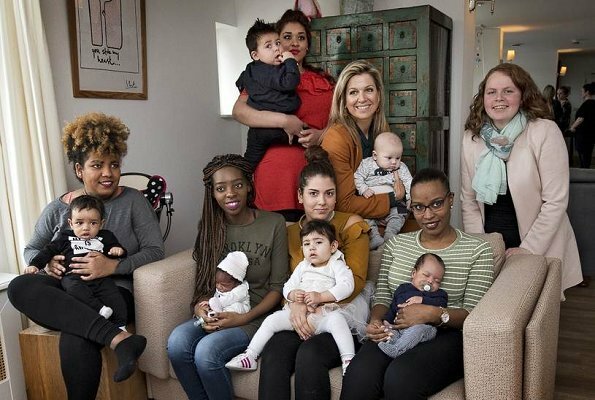 The International Women's Club in Copenhagen is a network for foreign women and Danish women who have lived abroad. On Thursday, a new Ice-hockey hall was opened in Ockelbo. The Ice-hockey hall was opened with an exhibition match played between Ockelbo HC and Generation Pep teams. 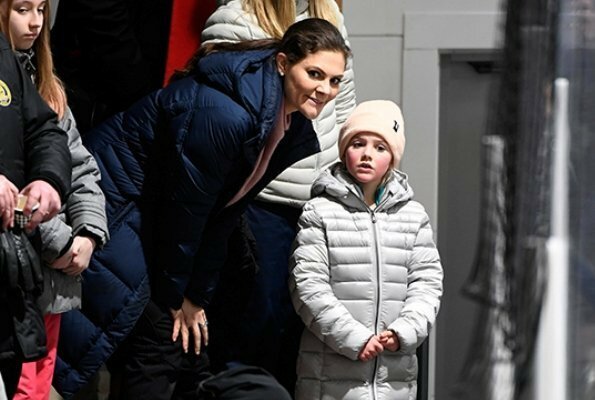 Prince Daniel joined his team although he was ill and Crown Princess Victoria, Princess Estelle and Prince Oscar sat on the stands to support Daniel. Prince Daniel's team won the match by 8-6. Generation Pep is an organization of the Crown Prince couple, which tries to encourage Swedish children and young people to do sports. Princess Charlene of Monaco celebrates her 40th birthday today. Princess Charlene (Charlene Lynette Wittstock was born on 25 January 1978 in Bulawayo - Zimbabwe), is a former Olympic swimmer and wife of Prince Albert II. 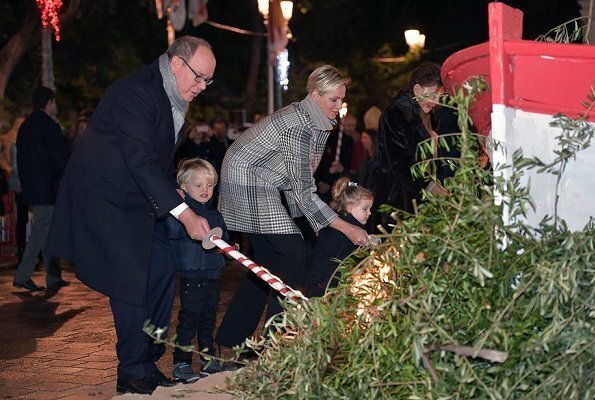 Charlene met Prince Albert at a swimming competition in Monte Carlo. Ten years later, the couple became engaged, and in July 2011 they officially wed. The couple has two children, Princess Gabriella and Crown Prince Jacques. Happy birthday to you, Princess Charlene. 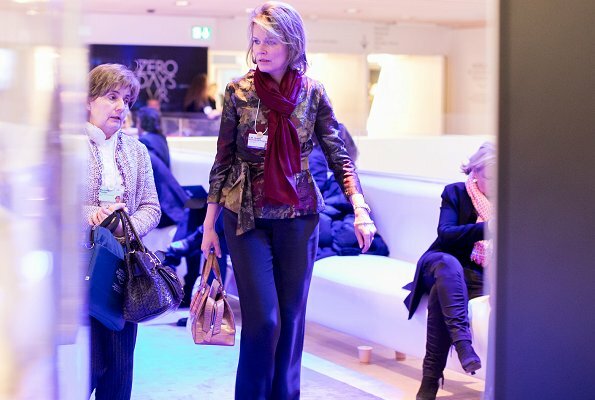 On January 24, 2018, Queen Maxima of The Netherlands, King Philippe and Queen Mathilde of Belgium, King Abdullah II and Queen Rania of Jordan, Crown Prince Haakon and Crown Princess Mette-Marit of Norway attended the 48th annual meeting of the World Economic Forum (WEF) in Davos, Switzerland. Crown Princess Victoria of Sweden who hasn't performed her official duties for about 1 month due to her illness recovered and returned to her official duties. 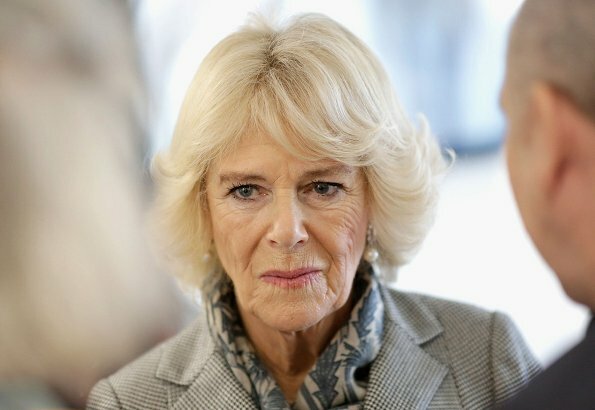 Yesterday, she attended a meeting with the British Ambassador and today, she attended two meetings held at the Stockholm Royal Palace together with Prince Daniel. 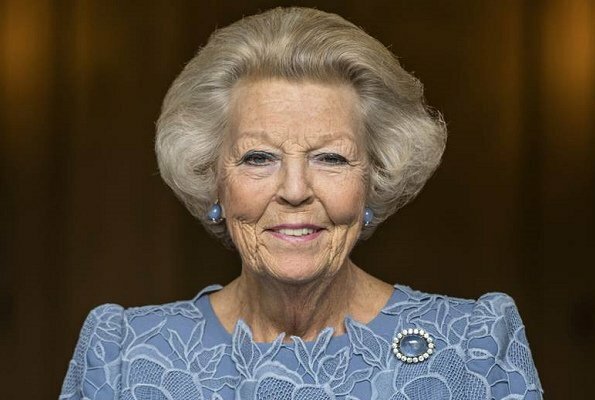 She firstly attended board meeting of The Crown Princess Couple's Foundation and then meeting of the steering group of Generation Pep (GEN-PEP). 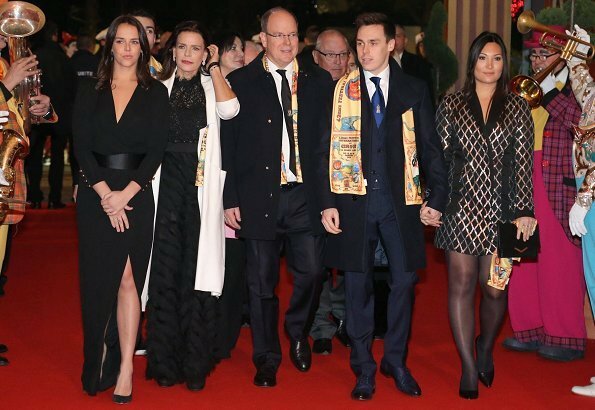 On January 23, 2018, Prince Albert II of Monaco, Princess Stephanie of Monaco, Pauline Ducruet, Louis Ducruet and his girlfriend Marie Chevalier attended the Award Gala and Closing Ceremony of the 42nd Monte-Carlo International Circus Festival held at the Chapiteau of Monaco (Chapiteau de l'Espace Fontvieille) in Monaco. Today, Princess Athena of Denmark celebrates her sixth birthday. 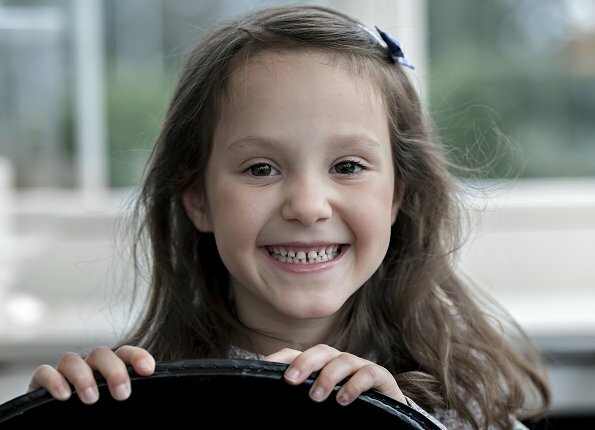 On the occasion of that birthday, the Royal Court of Denmark published a new photo of Princess Athena. 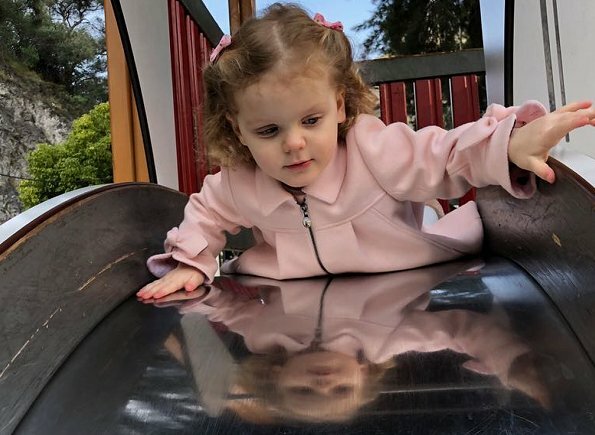 Princess Athena is the youngest child of Prince Joachim and Princess Marie. 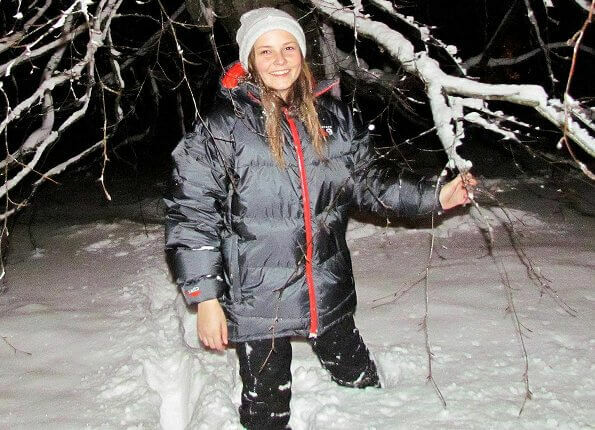 She was born at the Copenhagen University Hospital in 2012. Happy birthday Princess Athena. Today is January 23, 2018 and Princess Caroline of Hanover celebrates her 61st birthday. Princess Caroline (Caroline Louise Marguerite Grimaldi) was born on January 23, 1957 in Monaco as the eldest child of Prince Rainier III and American actress Grace Kelly. 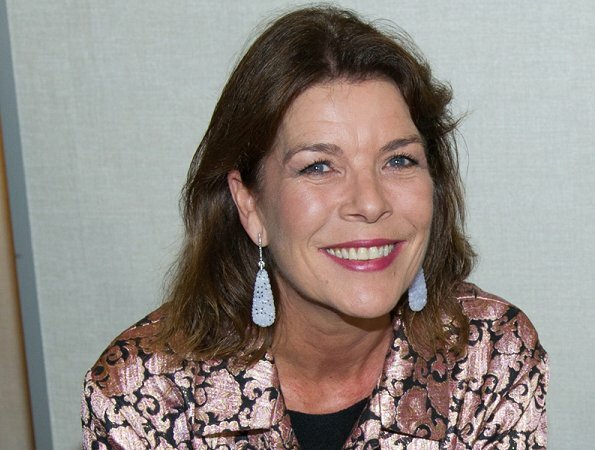 Happy birthday to you, Princess Caroline of Hanover. Countess Sophie of Wessex officially opened new Northern Ireland Hospice building in Belfast today. Northern Ireland Hospice is a local charity that provides specialist respite, symptom management, end of life care and ‘palliative’ care to more than 3,500 babies, children and adults every year across Northern Ireland. Countess Sophie wore Azzedine Alaïa wool blend knit dress which she had worn a few times before. 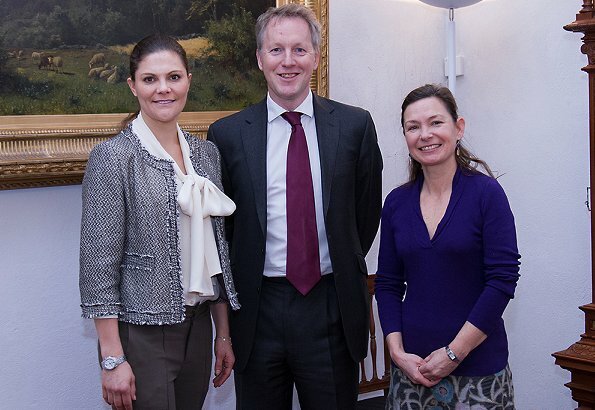 Crown Princess Victoria met with David Cairns and his wife Sharon Cairns at Stockholm Royal Palace. David Cairns is the British Ambassador to Sweden and the FCO’s Director for the Nordic Baltic Region. 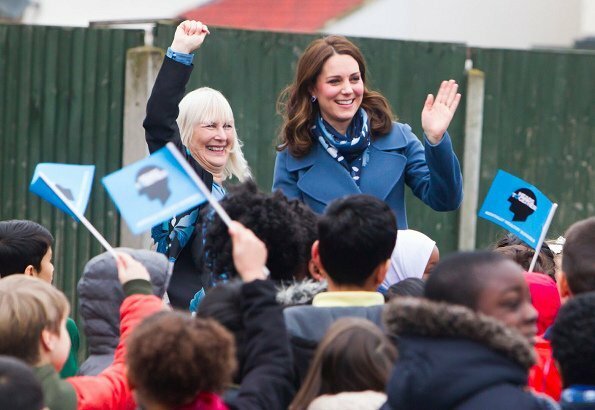 The meeting took place in connection with the official Sweden visit which will be made by Prince William and Duchess Catherine of Cambridge. The Duke and Duchess of Cambridge will make an official visit including Sweden and Norway between the dates of January 30 - February 2, 2018. 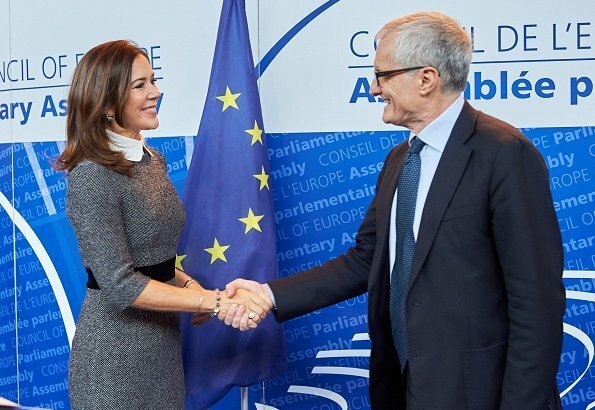 Crown Princess Mary of Denmark is currently in Strasbourg city of France to attend meetings of Parliamentary Assembly of the Council of Europe (PACE). Parliamentary Assembly Winter Session takes place on January 22-26 and Denmark performs duty as the president of the council until May 2018. The Crown Princess of Denmark gave an opening speech at the meeting. The speech supported works done to protect human rights, democracy and rule of law principle. On January 22, 2018, Princess Alexandra of Hanover, who is the little daughter of Princess Caroline of Hanover visited Giambattista Valli Haute Couture Spring Summer 2018 show as part of Paris Fashion Week. 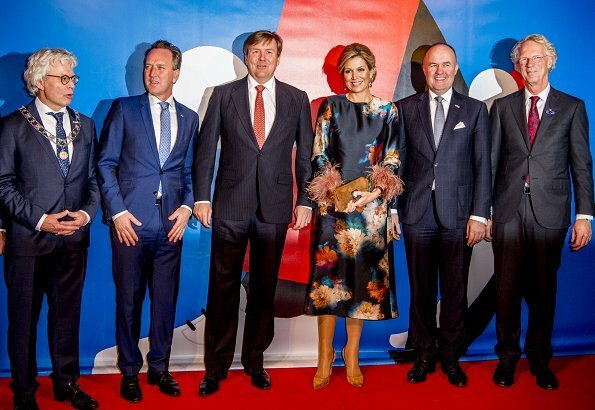 As the UN Secretary-General's Special Advocate for Inclusive Finance for Development, Queen Maxima of The Netherlands met with Panama's Vice President of the Republic and Minister of Foreign Affairs, Isabel de Saint Malo de Alvarado, at the Noordeinde Palace on January 22, 2018 in The Hague. 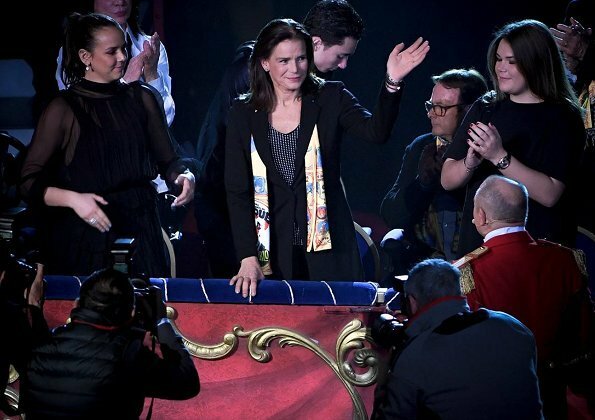 On January 21, 2018, Prince Albert II of Monaco, Princess Stephanie of Monaco, Princess Gabriella of Monaco, Crown Prince Jacques of Monaco and Pauline Ducruet attended the 42nd International Circus Festival held at the Chapiteau of Monaco (Chapiteau de l'Espace Fontvieille) in Monte Carlo in Monaco. On January 21, 2018, Crown Princess Mary of Denmark attended opening events of Aarhus European Volunteering Capital 2018. Aaurhus city which was European Capital of Culture in 2017 was selected as European Volunteering Capital in 2018 because it attached great importance to volunteering in local level. 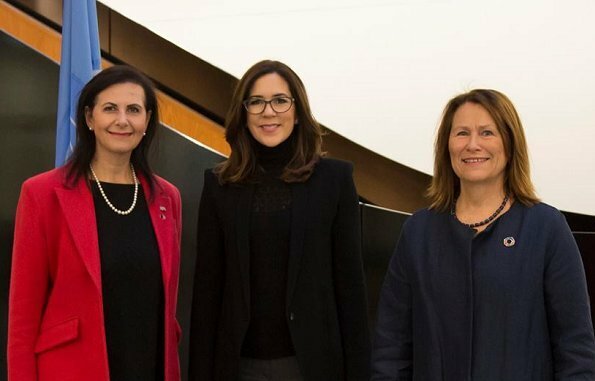 Crown Princess Mary is the patron of Aaurhus European Volunteering Capital City 2018. The aim of the initiative, co-funded by the EU’s ‘Europe for Citizens’ programme, is to promote volunteering at local level by recognising municipalities that support and strengthen partnerships with volunteer centres and organisations that involve volunteers. 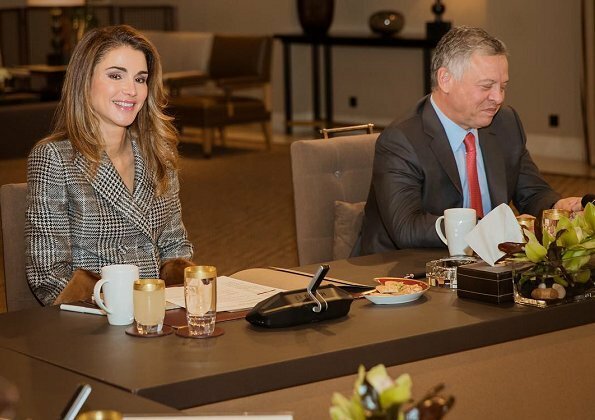 King Abdullah and Queen Rania of Jordan attended a working meeting at Al Husseiniya Palace in order to receive information about works carried out relating to "National Strategy for Human Resource Development (NCHRD)" and to listen to the recommendations. The Strategy deals with developing elementary education, higher education, technical education and vocational training sectors with the purpose of achieving a qualitative leap in human resources. Yesterday evening, Princess Charlene shared on her Instagram account new photos of her twins Prince Jacques and Princess Gabriella with the caption "A fun morning at the Monégasque Market #bugatti". The photos were taken by Princess Charlene. 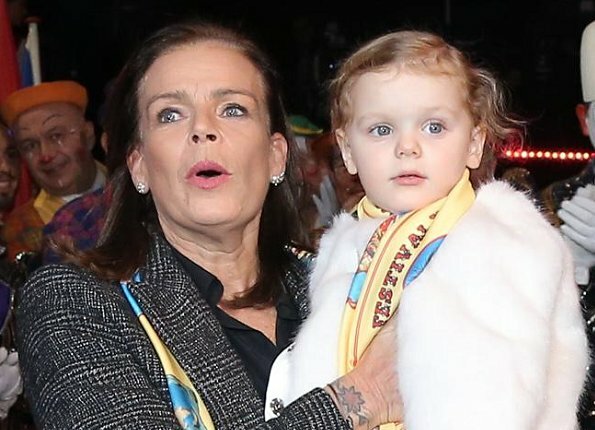 On January 19, 2018, Princess Stephanie of Monaco, Pauline Ducruet and Camille Gottlieb attended the 42nd International Circus Festival in Monte Carlo in Monaco, Monaco. The 42nd event is being held at the Chapiteau of Monaco (Chapiteau de l'Espace Fontvieille), an open-air amusement park by the sea.